As any Tribes player who has played anything more than simple pubs can probably attest to, having players instantly return the flag when it's off the stand is often times not the best of moves, especially if your capper has the enemy flag and is on his way home. It's much better/smarter to protect the flag when it's off the stand if you can, especially if your entire defense died from a offensive crash and there's no one on the stand. This can severely limit what the enemy capper can do if they're only used to running certain routes, and allows you to do timed returns. Unfortunately, a lot of people go for those instant returns either because they think it's the right thing to do, or simply to get a few extra points. It's not uncommon at all to get TK'd while going for a flag return just so someone else can get those points. An idea I thought of recently was to reward those who hold off on returning the flag instantly by awarding extra points based on the duration between someone returning the flag and their team capping the flag. So for example, if you return the flag and 5 seconds later your team caps, you get five points. If it's 4 seconds, you get 6 points. 1 second or less and you get 10. Whether or not there should be points given for anything longer than 5 seconds is up to the developer. This won't necessarily fix the 'issue' of dumb flag play, but it's at least some kind of incentive to play smarter, and something I haven't seen done before. I'll probably be throwing out this idea for the other games in development as well to see what they think. Another possible idea to go along with this, is to have the flag return timer on the flag itself. 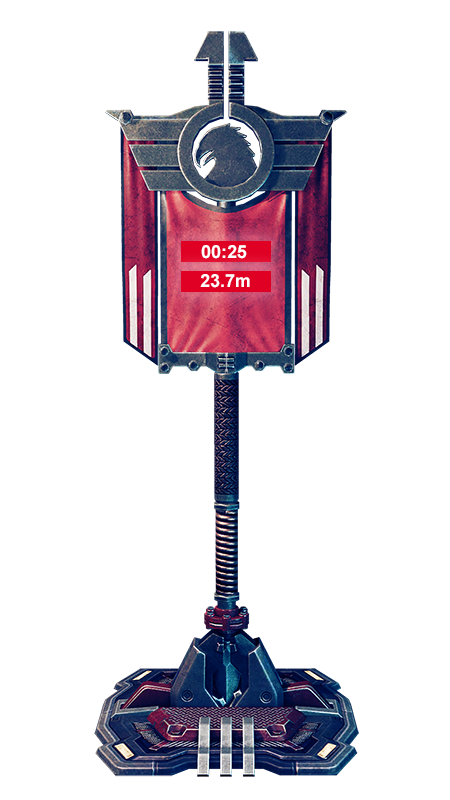 You could even display how far away your capper is from your stand, so you can tell exactly how close he is to capping. Crapy Photoshop concept. I don't know how I feel about this idea honestly. I keep thinking that I don't like the sound of it but going back and forwards between how it'd affect gameplay I simply don't know. You get ample reward in CTF games from timing returns - prevent enemies not taking your flag while your capper comes in, getting your players in positions to have the upper hand once you have capped.. with the risk of potentially being killed before you decide to return. It's a small risk-reward system that does give that little edge in teamplay if your team is communicating properly. Extra points for timings then amplifies the risk-reward, as you potentially have to wait (or wait longer) and time it right to get the most points.. I'm not sure how much I'd enjoy these clutch moments, especially as there's now a knockback weapon in the game now with a fairly large area of effect..
Then again, could be an interesting meta-game that rewards teams that don't kill cappers before they grab, but instead just afterwards so that they can return the flag whenever in the next however long (until auto-return). If that became a thing, cappers and capping runs would be given a greater role, but I simply don't know if gameplay would change in that direction. It wouldn't in pub games but competitive matches maybe, if the reward was high enough? But then it still goes back to my previous thought and then I get sad again lol. Brilliant idea Fixious. The question now is how does this get implemented? There would have to be, at the bare minimum, a string of text that identifies how many points you can get for a return at the current time. This would help integrate new players as well as help a team coordinate. Maybe have a "Return Now!" message appear on the screen when your capper is X number of units away from the flag? I think Fixious' motivation for the idea of a reward was to encourage smarter flag play, but I think for something like this, the game shouldn't tell the player how to play -- the player should still make the call. The decision shouldn't be based on how many points they get, but what's best for the match -- I don't think it's realistic for the game to always know what's best for the match, and even if it did, it removes the decision from the player and I'm not sure if that's interesting. So I'm not sure I want to try and incentivize certain flag behaviors with score. I already have another way to help alleviate selfish flag caps (players on same team fighting over the return/cap etc), which I consider a separate issue. You know the challenge races? My idea is this, when the player picks up the flag, a group of invisible checkpoints will activate, the flag holder won't know this though, anyway the game records how many times a single route is used, if the player is repetitive when capturing the flag, then the score won't be as high, if the player is unpredictable and uses a variety of routes, there will be a bonus in score, or maybe a buff such as a speed, damage or health buff, this encourages players to experiment with new approaches. Nah, if somebody is using the same route over and over again, then the opposing team should be smart enough to block that path. I think it should work like tee worlds, the enemy team get a point for taking the flag and 100 for capping. So its not the end of the world if somebody takes your flag, but it will mean that draws are less frequent and keeping your flag safe can prevent the opposing team from getting those few points that net them the victory; all without the game telling you what to do. This system will work in pubs and in comp matches and anything in-between. Well that's what i think anyways, at the end of the day i am not developing the game. Also sorry for necro, but i felt i had something to add to the discussion. We're talking here about rewarding smart flag play, when much of the discussion is smart defensive play. I'll say this - in the most recent playtest, a teammate of mine had grabbed the flag at the first stage I believe, and as he went out into 0g, he was killed and the flag drifted out towards the opposing team's starting base and I followed it a little. An opponent came along and sat right next to the flag and waited for me to come close, it took a short while for me to get close enough to kill him with the weapons I had, at which point he then returned the flag. By this point, he was not alone, I was unable to kill him, I died and the flag remained safe; had he returned straight away, I could've just turned back and grabbed it, with a headstart, too. Smart. Defensive. Play. I think @InevitablShenanigans is just talking about the challenge races, right? The idea of those is a competitive mini-game between matches and also offline, so varying player stats based on routes would be a bit counter-intuitive I think, but I can see where you're coming from with the logic. @Lightningy - I think getting points for taking the flag from the stand is completely reasonable, and perhaps you could also add a capped 'time holding' point system as well, so that if you just grab and die you get little, but if you grab, make it out but die on the way back, you still get some points for the effort maybe. I personally don't care about personal points, but team points need to be balanced very carefully. Arms of Telos actually already has a system to prevent draws. To win, it's not first to get a certain number of flag caps -- teams basically have a health bar (with three stages) and you win by depleting the whole thing. When you pick up a flag, you can stick around the flag stand and absorb more points the longer you stay -- when you cap the flag, it'll be worth more. I think it's a pretty cool risk reward system -- very risky to stay in enemy territory with their flag, but you can potentially get 3x as many points with a single cap if you do take that risk. The final flag (stage 3) behaves differently. Glad you continued the discussion. That is actually an ingenious system, it gives incentives to both the attackers and defenders. Very well put together, unlike many games nowadays that seem like they were designed by ten 8 year olds in separate rooms with no communication. I doff my cap sir.